Your books have a distinctive style - colorful and crowded with appealing detail. Could you name some of your artistic influences? Both broadly and as well as for children? I am admirer of most art. From the classics to the contemporary. For me art is about feeling and psychology. With adult art I enjoy mostly everything. If I do not like the art I still know that the artist poured their heart and soul into it, so I see it from that point of view too. Art is subjective. In children’s books, I love the artists that take the time to portray a story thoughtfully with soul and sensitivity. Book art helps a child learn to read and also FEEL something through the mood and tone of the colors. I am not a big fan of trends. Originality is the job of an artist. I guess being self taught is why I have a distinctive art style. Many of the books you have written or illustrated are set in New York. Is the city your biggest inspiration? Dear Art Directors and Editors: please do not stereotype me as only urban, I can paint most any subject you need. That being said, I am a New York City native, originally from the Bronx, one year in Greenwich Village and 31 years in Brooklyn. Although I travel, nothing lives up to the energy and cultural diversity of New York City. I just received a letter from Mayor Bloomberg praising Mermaids On Parade as a part of New York City’s cultural legacy, so the mayor sensed my passion. Another book I painted was A City Is, poems by Brooklyn’s first poet laureate, Norman Rosten. It took 14 years to get our collaboration published. I created many book prototypes in order to sell it. At first, I sketched cities around the USA. Eventually, the art became the reflected truth of Brooklyn native Rosten, as well as my own roots. I knew how to paint the our city’s moods and colors. Coney Island where Mermaids on Parade is set is an icon of visual style. How did you approach this challenge as an artist? Coney Island is an artist’s dreamscape. Surreal, child-like. flashing neon colors. Coney’s visual style reflects my own coming of age in the late 60’s, early 70’s. My heart is really into psychedelic art and music. Viewing ‘The Summer of Love’ exhibition at the Whitney Museum last year really helped me grasp the big influence that era had and still has on my innate art style. Coney's own history - from the 1800’s on - is also felt viscerally when you step foot in that neighborhood. A wild juxtaposition of old and new architecture. Truly diverse, which is Coney’s overall legacy in the tapestry of our country’s history. Of the books where you have been both the author and illustrator (such as Mermaids On Parade), could you explain how these books generally originate? Do you typically have an artistic vision that inspires the story? Or do you begin with a story or theme? Mermaids On Parade was an idea which grew out of community. In 2005, Brooklyn librarians Deloris McCullough and David Mowery told me what was missing on their bookshelf. About three months later, Tanya Rynd, who owns Superfine in Dumbo, Brooklyn invited me to join her performance art troupe, the Superfine Dinettes, and march in the upcoming Coney Island Mermaid Parade. I interviewed the Dinettes, asking them what the parade meant to them, why they marched. Then I experienced the parade first hand. The whole book was a synthesis of everyone’s good energy and ideas. I knew children would love the magic of the parade and costumes. Your books seem to have a fairly elastic age-span. Do you have an ideal audience or age level in mind when creating for children? I am lucky that my art has wide appeal. For children I try to be literal. (Although, A City Is is about silence and multi-dimensional consciousness!) For grown-up magazine art, I am more abstract and conceptual. My guess is that the art touches the spirit that exists in all age groups. Beauty contained in wonder, that child-eye vision. Posterband covers music as well. We'd love to know some of your favorite music that inspires you creatively. I am so lucky to have lived through the music renaissance of the 1960’s with the original musicians who started it. The Beatles, The Rolling Stones, The Doors (lately I am obsessed with their music once again). Jim Morrison was a visionary who was a grand emoter and not afraid to be openly anti-war. For Mermaids On Parade, there were mostly local Brooklyn band influences. I played their CDs at least once daily during production. The old timey sound of the Jug Addicts, the Wiyos, Jan Bell and Alex Battles really brought up that Coney Island honky tonk spirit from its hey day. The Gaijins A Go-Go and Les Sans Culottes added some feminine mermaid energy and color. A lot of these local musicians also march as characters in the book. 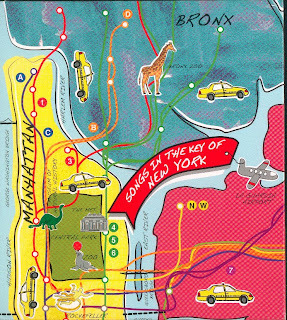 With Songs In the Key of New York, Jeremy Zmuda, Clare Muldaur (Clare & the Reasons) and crew deliver a thoughtful - and tuneful - children's primer celebrating the five boroughs from its famous subway lines to its friendly neighborhood restaurants. The songs are considerably more wordy and knotty than many children's records, studiously avoiding easy rhymes, and gliding along slantwise with cool, jazzy poise. But these are bright little pop gems at their core that you and your child will love to hear again and again. "Taxi," with quintessential New York impatience as its catchy chorus, is a particular charmer. And if you love this record, you might want to check out Clare & The Reasons "The Movie" (with guest appearances from Van Dykes Park and Sufjan Stevens). Clare & the Reasons are on tour now with My Brightest Diamond. This Is A Poem That Heals Fish is a rare little miracle of a book. It manages the brilliant trick of explaining the abstract concept of a "poem" to a child through the simple but effective art of demonstration. The book itself is a perfectly constructed poem. I say this as someone with some experience with poetry as an editor and screening judge for the National Poetry Series for nearly a decade. I can't tell you how many times I've watched a poet crash and burn attempting to define a poem with a poem. Too often it results in a disappointing tautology (there's a word for the little ones!). A poem is by nature slippery (like a fish), but this book succeeds with its perfect little slipknot metaphors that manage to delight and define at the same time. Perhaps it's best to leave it to the baker to explain: "[a poem] is hot like fresh bread. When you eat it a little is always left over." The book is painted in a beautiful palette with a bold brushwork and delicate penciled details, alternating between folksy domestic scenes and lovely surreal dreamscapes. It's a great looking book. 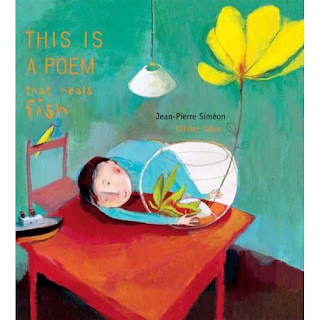 This Is A Poem That Heals Fish by Jean-Pierre Simeon and illustrated by Olivier Tallec was originally published in France. This translation was published by Enchanted Lion Books. Enchanted Lion Books (of Brooklyn!) 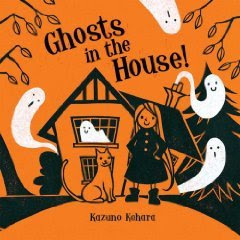 has been bringing some excellent European and Asian picture books to the U.S. in translation in recent years. You can expect to see some more posts on Posterband soon from this exciting publisher. Check out This is a Poem That Will Heal Fish (a.k.a This is a Book Your Child Will Love).